November is National Healthy Skin Awareness Month. Because our skin is the largest organ throughout our bodies, taking care of it should be more of a priority than most individuals realize. Many people don’t know that everything that touches our skin penetrates our body, bloodstream, and organs. It’s essential to use the most natural ingredients and stave off chemical-laden products as much as possible. No Chemicals—Toxins and chemicals like sodium laurel, laureth sulfate, parabens, pesticides, and mineral oils are harmful, carcinogens, allergens, and pore-clogging ingredients that are absorbed directly into your skin and into the body, which creates an unhealthy environment and causes adverse reactions and damage. Even more dangerous, some of these chemicals and toxins are absorbed directly into the lymph nodes and bloodstream, which causes disease states and disorders to arise. Natural Ingredients Are More Synergistic—Natural and organic skincare is strictly regulated and must have at least 95% of its active ingredients from organic plants, as opposed to chemically derived skincare, which generally only have 5% active ingredients and some of those are toxic chemicals. Because organics are free from dyes, chemicals, preservatives and more, they are also much less harmful. Preserving the Environment—Naturally grown products are ecologically safe and also protect our wildlife. 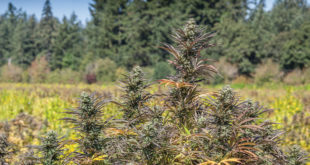 The soil is free of chemicals, and the plants and animals are not harmed or negatively affected. With chemical-laden farming, some of our bird, bee and butterfly populations are dying off, due to the toxic effect on their bodies. Naples Soap Company offers the highest quality natural bath and body products with the health of your skin in mind. Founder and CEO, Deanna Wallin was looking for alternative options for her and her daughter’s battle with eczema. All of their products are carefully crafted with natural ingredients, but for those individuals with allergies, skin irritation, eczema or psoriasis, the sensitive skin line is highly recommended. 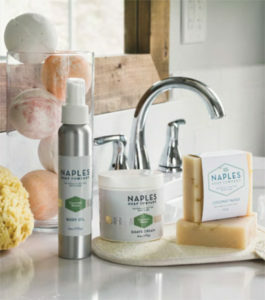 Naples Soap Company also created an eczema kit. These eczema products are incessantly sought-after due to their skin calming effect, as well as inflammatory relief and anti-itching capabilities. With ingredients like sea salt, oat flour kernel, coconut oil, and yogurt extract, the healing results are incomparable. You don’t always need prescription medication or ointment to relieve skin issues. Many individuals are finding relief the natural way with Naples Soap Company’s skincare, additionally; many physicians are recommending these products for their patients as well. From the body butter to their shampoo, when you step into one of their stores, all of the products invigorating scents, health benefits, and beauty are mesmerizing. Since launching Naples Soap Company ten years ago, the company is now in eleven retail locations in Florida to serve you. To find out more, please visit naplessoap.com, or stop by one of their stores.